India is one of the most popular destinations for wildlife safaris in the world. From north to south, west to east there are several wild life sanctuaries to visit here. You will be surprised to know that there are almost 500 wild life sanctuaries, safaris and wildlife parks scattered all over the country. These vast sanctuaries are spread over 1000s of square kilometres to accommodate the wild beasts' natural habitat. Going through these safaris gives a feel of adventure to the brave person who makes the trip. Get the feeling of moving through the forest literally – among the beasts in rough paths paved between untrimmed trees. 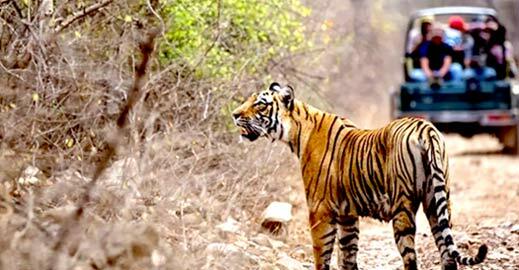 There is a variety of safaris and tiger reserves all over India to choose from. we have an amazing list of wildlife tour packages to choose from. So what are you waiting for? Check out the tour packages below to best suit your needs. There are exhilarating chances to meet with wildlife while you are in the open-air safaris. While you finish with your wildlife journey the experience travels with you for the rest of your life. Several wildlife enthusiasts and nature lovers throng the innumerable wildlife safaris of India. There is a plethora of options to explore at nature’s wild habitats. It is a thrilling wildlife safari for all - Adventure seeking tourists, wildlife scholars, or a year - end holiday. This makes the best holiday trip for you, your family & friends and all holidayer. There are distinguished species including barking deer, marsh crocodile, and 100s of various mammals, fishes, insects and birds. Move through the world -famous Jim Corbett National Park, the Ranthambore National Park, Kanha National Park, and Bandhavgarh National Park in various zones in India. Admire the wild beasts as they majestically prowl around as you travel along with them in the Gir Forest. The Sundarbans national park in west Bengal has river where visitor take a boat ride and spot a tiger swimming in the water! If isn't enough then visit Assam's Kaziranga National Park where you can spot exotic wild species of various types. This includes the horned rhinos, wild bears, elephants, etc in this sanctuary spread over 420 kilometres. Choose from our selection of exciting wildlife tour packages across India for your next holiday. Mumbai - Kanha - Bandhavgarh - Agra - Bharatpur..